Welcome to Engaged Family Gaming! We’re here to help you get your family game on! Join our founder Stephen on his commute to work as he talks about all things Gaming! Xbox One S All Digital Edition and PS5 Info all in one day?!?! Join Stephen on his ride to work as he talks about the release information for the Xbox One S All Digital Edition and the first details about the PS5. Changing the Conversation About Video Game Addiction. Join Stephen on his ride to work as he talks about Video Game Addiction and how we need to start talking about WHY kids/adults are playing games for so long as opposed to blaming it on games. Best Buy Leaked Three New Nintendo Switch Games! Join Stephen and he talks about three Nintendo Switch games that were apparently leaked by Best Buy! Join Stephen on his ride to work as he talks about the evolution of his thoughts on screen time and a few strategies that families can use to deal with it. Magic The Gathering War of the Spark Unveiled! Join Stephen on his ride to work as he shares his thoughts on the reveal of War of the Spark! The Games of #PAXEast 2019! Join Stephen on his ride home from Boston as he talks about some of the awesome games he played during #PAXeast2019! Concrete Genie is my most anticipated game of 2019! Join Stephen in his ride to work as he talks about the State of Play video released by Sony and explains why Concrete Genie is now his most anticipated game of the year. Two New Switches You Say? Join Stephen on his ride to work as he talks about recent reports in the a Wall Street Journal about two updates to the Switch hardware that might be announced as soon as E3! Join Stephen on his ride to work as he shares some of the highlights from the 3/20 Nindie Showcase! Join Stephen on his ride to work as he shares his concerns about Stadia and some of the challenges it faces. In Honor of Journey’s 7th Birthday!! Join Stephen on his ride to work as he talks about Journey on its 7th birthday! Join Stephen on his ride to work as he tries something new and gives a *spoiler free* review of Captain Marvel! Google is Making a Console and it’s Being Announced Soon! Join Stephen on his ride to work as he shares his thoughts on Google’s future in the video game space. Join Stephen on his ride to work as he admits some of his faults, and gives everyone an important lesson: take account security seriously. Stephen, Evan, and the Infinite Co-host come together for a special episode of the EFG Daily Commute. They were driving home from the VT State Magic The Gathering Championships and took the chance to talk about War of the Spark and the HUGE number of Planeswalkers in the set. Join Stephen on his ride to work as he talks about Nintendo’s new LABO VR kit! Microsoft Releasing an Xbox without a Disc Drive? Join Stephen on his ride to work as he talks about recent reports about an Xbox with no disc drive that is apparently coming to retail in the next few months! Would you buy one? New Dungeons and Dragons Books for Kids! Join Stephen on his ride to work as he talks about Dungeons and Dragons and a new line of products, targeted at kids, coming from Wizards of the Coast. The #MomoChallenge is (Mostly) a Hoax But We Can Learn From It Anyway! Join Stephen on his ride to work as he talked about the Momo Challenge, his frustrations with content creators, and what parents can learn from it (even though it isn’t a thing). A Follow-up on My Thoughts on User-Reviews! Join Stephen on his ride to work as he talks about this updates thoughts on User reviews! Announcing Talisman: Kingdom Hearts Edition! 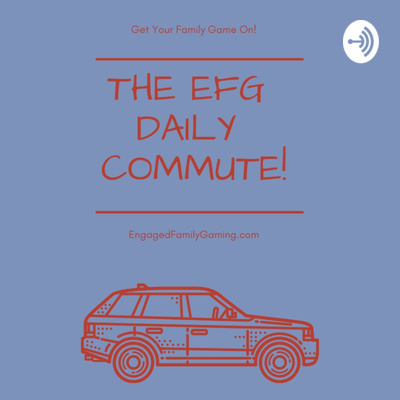 Join Stephen on this special episode of the EFG Daily commute with a special new update! The OP (formerly USAopoly) has announced Talisman: Kingdom Hearts Edition! HOW AWESOME IS THAT! Join Stephen on his ride to work as he talks about what he would do if he ran Square Enix. Join Stephen on his ride to work as he talks about Tetris 99 and makes a very bold prediction and explains how the game works. Join Stephen and Linda on their drive home from NY Toy Fair as they talk about their top two games of the show. Even MORE thoughts on the Nintendo Direct! Join Stephen on his ride to work as he shares more thoughts about this year’s Nintendo lineup after all of those big announcements. My thoughts on the #Nintendo Direct! Join Stephen on his ride to get Valentine’s Day cards for his daughter’s class (because parenting is hard in 2019) while he talks about some of the exciting points from the 2/13/19 Nintendo Direct. Balancing Relationships, Children, Work, and Content Creation. Join Stephen on his ride to work as he talks about how he manages to balance his marriage, his kids, his gaming, and his website. (Spoilers: very carefully). Join Stephen on his ride from from bringing his wife coffee as he talks about the video games he needs to play this year. Join Stephen on his ride to work as he talks about the various Mini Consoles and whether or not they are a fad! Join Stephen on his ride to work as he shares his thoughts on how important it is that we teach our children to listen to others (especially marginalized people) about their experiences. Join Stephen on his ride to work as he talks about Microsoft bringing Xbox Live to the Nintendo Switch! Join Stephen on his ride to work as he talks about his time in the Anthem demo and the surprise announcement and release of Apex Legends. Stephen shares his thoughts on the closure of the Wii Shop Channel and what it showed us all about the dangers of an all digital future. Stephen shares his Kingdom Hearts 3 impressions today! Stephen spent his ride to work today giving advice to other content creators who might be thinking of doing their own thing. Join Stephen on his ride to work as he talks about his time playing Magic: The Gathering Arena! Join Stephen as he rides into work and talks about EA and the state of their exclusive rights to make Star Wars video games. Spoilers: it’s not going very well. Join Stephen as he drives to work and talks about his experiences with turning his daily to do lists into a mini game for himself. Where are all the #Nintendo Sports games? Join Stephen on his ride to work as he talks about his wishlist for Nintendo Sports games! Join Stephen on his ride to work as he shares his early impressions of the new book “The New Childhood” by Dr. Jordan Shapiro. Join Stephen on his ride to work as he talks about his families experiences with a second Switch. Our most anticipated video games of 2019! Join Stephen on his ride to work as he talks about his most anticipated video games of 2019! Episode 34: The EFG Video Games of the Year 2018! Join Stephen on his ride to work as he talks about the Engaged Family Gaming Video Games of the year for 2018! Episode 33: Looking into the Future of EFG! Join Stephen on his ride to work as he looks forward to EFG’s mission for 2019 and Beyond! Episode 32: Tips (and Gifts) for The Budding Game Designer or Content Creator in Your Life! Join Stephen as he drives to work and shares his advice for parents who have aspiring game designers and content creators in the family! Episode 32: Epic Games Is Being Sued Over #Fortnite Dances! Join Stephen on his ride to work as he talks about a pair of lawsuits being brought against Epic Games! Join Stephen on his ride to work as he talks about Kingdom Hearts 3, expresses his Spoiler concerns, and talks about how to deal with Gatekeeping in fandoms. Episode 30: #Fortnite isn’t Just a Game Anymore! Join Stephen on his ride to work as he briefly discusses the idea of Fortnite transcending it’s status as merely a game and become a place for kids to socialize. Episode 29: Long Live the #Nintendo 3DS! Join Stephen on his commute to work as he records a quick episode to share his thoughts on the 3DS and why it is still a good purchase for your kids (especially the younger ones)! Join Stephen on his commute to work as he talks about the different kinds of video content available online and some of the questions we should ask our kids about what they are watching. Episode 27: My Thoughts on #SuperSmashBrothers DLC Characters! Join Stephen on his ride to work as he shares his impressions of Super Smash Brothers and his ideas for Smash DLC characters. Join Stephen and Evan as they drive and talk about all of the family friendly video game announcements from the #GameAwards 2018. Episode 25: #Fortnite Season 7 Is Here! Join Stephen on his ride to work as he talks about the new stuff coming in Fortnite season 7 and thinks about Fortnite’s potential lasting legacy. Episode 24: Epic Games Has a Store Now? Join Stephen on his ride to work while he talks about Epic Games and their upcoming adventures in online game sales. Episode 23: #Fortnite Season 7 is Coming! Join Stephen as he discusses some of Fortnite’s baked in parental controls. He also talks about the incoming Season 7! Episode 22: So You Bought a Console for the Holidays. Now what? Join Stephen on his ride to work as he shares a PSA about what to do with that wonderful new Nintendo Switch, PS4, or Xbox One between now and when you give it as a gift! Episode 21: Are the Classic “Mini” Consoles a Fad? Join Stephen on his ride to work as he tells a funny story about his ride home last night AND shares his thoughts on the Mini console craze. Episode 20: #Nintendo Made a BIG Change to the Creator Program. Join Stephen and Evan as they drive home from an event. They talk about the changes Nintendo made to the creator program. Join Stephen on his ride to work and he talks about how he and Jenna decided to get rid of Fortnite for a while. Episode 17: No. There Should NOT Be A “Mature” #Pokemon Game! Join Stephen on his ride to work as he shares his thoughts on the recent “movement” to encourage The Pokemon Company to develop and release a Pokémon title targeted at adult fans of the series. Episode 16: Happy 20th Birthday #LegendofZelda Ocarina of Time! Join Stephen as he talks about his memories of playing Legend of Zelda Ocarina of Time! Join Stephen on his ride to work as he shares his feelings on User Reviews for games and movies. Episode 14: Pokémon Let’s Go Eevee Impressions And Gacha Mechanics! Join Stephen on his ride to work as he shares his impressions of Pokémon Let’s Go Eevee and discusses Gacha Mechanics in mobile games. Join Stephen and Evan as they discuss why they think NOW might be the time to look into a second Switch for your family. Episode 12: #PlayStation is skipping -#E32019 and an #Xbox With No Disc Drive? Join Stephen on a special ride into the office. He’s talking about Sony skipping E3 2019 and sharing his thoughts on an Xbox One with no Disc Drive! Episode 11: How Do You Choose Your Character Names? Join Stephen on his ride to work as he talks about how he chooses names for his characters. He also poses the question: How do YOU name your characters? Episode 11: Good Golly it’s #TheGameAwards! Join Stephen on his ride to work as he discusses the nominees for his year’s Game Awards! Join Stephen on his ride to work while he talks about the PS1 Classic and how it compares to the SNES Classic. Join Stephen on his ride to work while he shares his history with Star Wars and why he is so perplexed by the way EA is handling their exclusive license. Episode 8: #Microsoft, #Minecraft, and Much More! Join Stephen and Evan as they head to the store! They talk about the Microsoft X018 event! Join Stephen on his ride to work as he talks about the end of Final Fantasy XV DLC development and where he wants the franchise to go moving forward! Join Stephen as he recaps his feelings about Blizzard’s unforced errors during their annual Blizzcon event. That one where Stephen apologizes to the Internet for dismissing their concerns about Smash. Join Stephen as he drives to work and talks about his earliest video game memories, shares a wild speculative theory about Red Dead Redemption 2, and the potential for a new Bully game from Rockstar. Stephen and Jacob commute to school and talk about Fortnite! Today Stephen spends his right to work talking about the importance of story in video games.